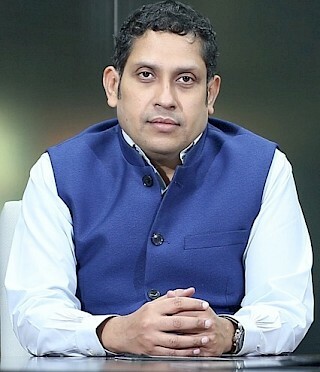 Praveen Chakravarty is a political economist and Former Resident Senior Fellow at IDFC Institute. Chakravarty’s research focus is empirical research using diverse datasets for policy outcomes. It encompasses public policy issues in finance and macro economics and also political economy using electoral data. His work has been published and cited in all mainstream and research publications in India and in foreign publications such as The Economist, Bloomberg, Foreign Affairs, South China Morning Post etc. He is also a Contributing Editor to BloombergQuint, Bloomberg TV's India venture, where he writes a popular column and hosts a show titled "Noise to Signal". Chakravarty previously served as Managing Director of Thomas Weisel Partners in the US and BNP Paribas India. He is a member of the Secondary Markets committee of the Securities & Exchange Board of India and an Independent Director in the TVS Group of companies in Chennai. He co-founded Mumbai Angels in 2006, India’s largest angel investing group. Chakravarty also worked with the Unique Identity Authority of India (UIDAI) in the UPA2 government led by Dr.Manmohan Singh. He served as an advisor to the Tamil Nadu government on GST in 2016. He is the Founding Trustee of IndiaSpend, India’s first non-profit data journalism initiative. He is a board member of PRS Legislative Research, a non-profit that provides legislative support to Members of Parliament and of Centre for Civil Society, India's highest ranked domestic think-tank. Chakravarty holds an MBA from The Wharton School and an undergraduate degree from BITS Pilani. In a blog post of the Harvard Economics Review, CAFRAL's Sujan Bandyopadhyay and Anmol Agarwal quote our work on regional divergence. The BJP has not shown any signs of improving its tally in its weak large states such as West Bengal, Tamil Nadu, Kerala, Andhra Pradesh and Telangana. The Economic Survey of 2017-18 was presented recently by Chief Economic Adviser Arvind Subramanian, who said that he learnt 10 new things while preparing this survey. The three stars— a ruling party’s Parliament majority, development agenda and low oil prices— may never align again, that is the biggest takeaway from Economic Survey 2018.